But, The Hypocrites take on H.M.S. Pinafore, first performed in 1878, is the one world premiere in their Gilbert and Sullivan Rep, which includes reworked versions of their previous takes on Pirates of Penzance and Mikado. While not as zanily delightful as Pirates, reviewed here last week, this H.M.S. 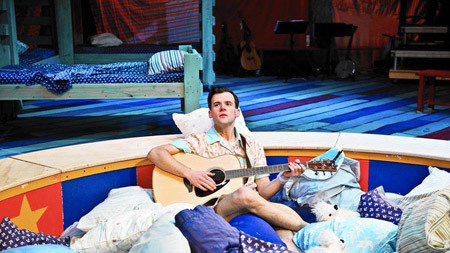 Pinafore does contain loads of inventive, gender bending joy. Here, elastic director Sean Graney re-imagines Pinafore’s manly sailors as wily women and Lil’ Buttercup, the show’s best known character, as a sensitive love struck male. Thus, romantic lead Josephine becomes Joseph (a truly winning Doug Pawlick), ultimately, giving the proceedings a surprise feminist bent. With the object of beauty decidedly masculine, Graney allows traditional roles in theater, and life, to be given a potent reexamination. It is the highlight of this very fun evening. Of course, Graney’s indulgence in an aquatic playground theme here is, also, invigorating. Audience members are encouraged to sit in the set’s various kiddy pools and make use of a playground slide while the action is occurring. Coordinated with unerring finesse by stage manager Miranda Anderson, performers such as the golden Emily Casey, portraying the ship’s captain, bloom in such a creative environment. Thus, The Hypocrites’ trip into this comic operetta is among the year’s very best. H.M.S. Pinafore runs through February 7 at The Den Theatre, 1333 N. Milwaukee Ave, in Chicago. Tickets are $36-$50 and can be purchased by visiting the-hypocrites.com. Seeing as this year is drawing to a close, it seems like the proper time to acknowledge the rest of the best of 2014, as well. Best Actress (Drama) – Lia Mortensen, Annapurna. (Profiles Theatre) In this poetic drama, theater veteran Mortensen blazed with raw emotion and seasoned sexuality. As a damaged mother and lover seeking to understand past wrongs, she was simply luminous. Best Actress (Musical) – Caitlin Jackson, Witches Among Us. (New American Folk Theatre) As an enchanting witch running a nightclub and an underground society, Jackson connected with brash star power and a subtle sense of humor. Her magnetic presence carried this new, original musical, proving she is a force to watch out for. Best Actor (Drama) – Nick Leininger, Nosferatu. (Silent Theatre Company). Even under layers of effective make-up, Leininger brought a tortured subtext and a creeping sexuality to his demanding Count Orlock. It was truly an impressive performance. Best Actor (Musical) – Adam Michael, Dee Snider’s Rock & Roll Christmas Tale. (Broadway in Chicago). Playing the attention seeking lead singer of a glam metal band, Michael brought a truly magnetic heart to his work, even when his character was being less than loveable. It was a truly notable feat. Best Supporting Actress – Mary Anne Bowman, The Haunting of Hill House. (City Lit). Bowman brought a sensuously worldly quality to Theodora, a bohemian who takes a mousy co-worker under her wing. Almost casually, Bowman invoked the glamour of the late 50s here, making Theodora akin to that mystical aunt that you always wanted to sit next to at family gatherings. Best Supporting Actor – Dan Waller, Lay Me Down Softly. (Irish Theatre of Chicago) As a lame boxer putting his life on the line for a rundown carnival, Waller connected with fierce and humble pride. It was a blazing, true-to-life performance, standing out among an equally fine ensemble. Best Play – Annapurna. (Profiles Theatre) A beautiful look at two lives crumbling under regret, this piece examined what happens when a dying poet is forced to face the truth of his past via an unexpected visit from his beautiful ex-wife. Sharr White’s work was full of unexpected gorgeousness, brought out by a talented cast, skilled directing and an amazing set designed by Katie-Bell Springmann. Best Musical – Carrie, The Musical. (Bailiwick Chicago). This take on Stephen King’s classic tale of horror was highlighted by some kinetic pop songs and direction that gave sympathetic depth to even the vilest antagonists. On the whole, it was layered, exciting work. Best Director – Matt Foss, The Jungle. (Oracle Productions). Foss took an almost relentless bleak tale about life in the Chicago stockyards and filled it with inventive stagecraft and potent musical interludes. It spoke to his truly fine and industrious imagination.